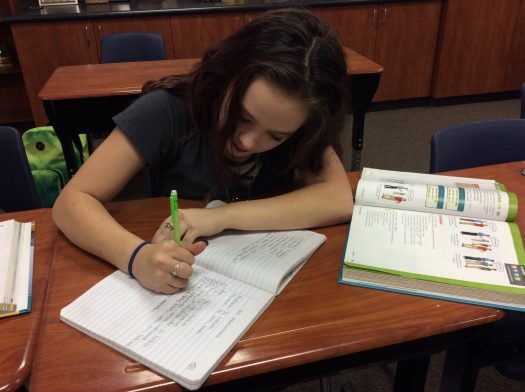 Freshman Michelle Hays works on an assignment during class. Born in Arizona, Michelle Hays has just returned to Buffalo starting her freshman year. Hays Lived in Buffalo her first grade year through fourth grade year, then moved to Dew. She loves Buffalo and considers it her home. Hays spends most of her days away from school hanging out with her friends and babysitting. Her friends are important to her. Her friends describe her as shy and quiet – that is, they say, until someone gets to know the real her. Hays said she also tries to focus on school work, alongside with doing volleyball, and FCCLA. She said she plans to move to California after school and college.